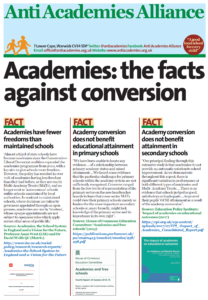 ← Anti Academies Alliance Newsletter: 18 November 2013 – Profits for parents? There is a distinct possibility that Dorothy Barley Junior School will become an academy. If this is allowed to happen there will be massive changes, with no way back, and huge implications for the school’s staff and students. This will mean that it will no longer be part of the family of schools in Barking and Dagenham, a policy fought for and strongly defended by the Authority and virtually all Headteachers. All staff at Dorothy Barley Junior School have voted to oppose this conversion to academy status, with a group called REAch2 as its sponsor. They are committed to keeping the school under the protection of the local authority, so please join them in opposing any attempts by the independent sector to take control of our school. 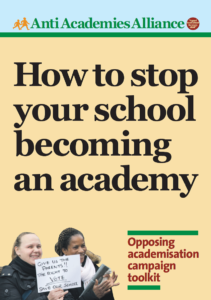 · Academies are not democratically accountableto their local communities; they do not have to listen to parents or the public. · Academies use unfair admissions and disciplinary procedures, to change their school population. Sign the petition, write to your councillor and MP and tell REAch2 you do not want an academy at Dorothy Barley Junior School. 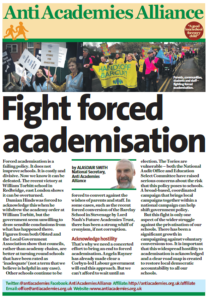 This entry was posted in News, Top story and tagged Forced academisation, Primary, Rejecting Academy. Bookmark the permalink. Barking and Dagenham Council will ballot the parents of any school in the local authority who by choice or direction apply to become an academy. This comes as parents and community members rally around the campaign to stop an academy at Dorothy Barley Junior School in Dagenham. Parents at a Public Meeting rejoiced at the news that the parents at the school would be balloted and vowed to take the campaign to save their schools to Michael Gove’s doorstep. This is a direction challenge to Gove and his plans to hand our schools over to private companies. Parents at Dorothy Barley Junior School demand a parents’ ballot at the Public Consultation on the forced academy. At a meeting of a 100 REAch2 and the D of E were told by staff, parents and community members to leave their school under the care of the Local Authority. Come to the Public Meeting at Dorothy Barley Infants School Hall on Tuesday 10th December 6-00pm – 8-00pm . This meeting has been organised by parents, local unions and community members. Don’t miss this opportunity to save our local school and keep it in the Barking and Dagenham family of local schools. I have a daughter in Dorothy Barley Junior school and do not wont it to change to an academy. Went to a meeting last night and all the questions the parents were asking were not answered. The education lady there was very one sided and only talked about the negatives of our school staying as it is, and all positives to change to an acadomey. The REAch2 Steve Lancashire all told some storys. One was about his wages. He said he was only being paid a head master wages. I went on the official REAch2 web site and he is an execitive for reach and Chief exective master for Hillyfield primary academy and Mission Grove Primary School. I then went on to the vaccancys and they are advetising for Executive Principals (4 posts available) Salary £88K to £100K depending on experience. So whatis he really being paid. They should let Mr Kendricks and his team carry on the work they are doing to bring our school up to GOOD. Mr Kendrick needs to be given the 6 years that Steve Lanchaire said it took him to get his school to good standard and keep there. Sorry was so angry after meeting last night. Save dorothy barley! I have so many childhood memories from this school, it will never be tge same if it changes to an academy! Listen to the staff, pupil and community voice. This school is a landmark for Dagenham. Nearly everyone you speak to young or old knows about Dorothy Barley or have attended there, and plenty also know and are friends with the caretaker! it would be highly disappointing if this changed. My family all enjoyed attending dorothy barley so if it was to change to an academy I don’t think many people would want to attend. 3 generations of my family have attended Dorothy Barley. Would be a shame for it to be turned into an academy. My eldest son had an excellent start at Dorothy Barley, he graduated from uni last summer. My youngest goes to an academy and it’s nowhere near as good as Dorothy Barley was. Dorothy Barley doesn’t need to be an academy, it’s a wonderful little school and the centre of a fantastic little community. If anything, other schools should be following their example.